In preparation for next week's upcoming collab on Jon Favreau's adaptation of The Jungle Book, it only makes sense that I share my background concerning this ever popular tale. Like many other children born on the cusp of the Disney Renaissance, I spent a great deal of my younger years reflecting on earlier classics as well as current offerings. The Jungle Book, Robin Hood, and Oliver and Company were my favorites, so naturally I was thrilled and hesitant when I heard about the live-action remake. Thrilled definitely won out in the end, but more on that next week. I honestly don't remember how old I was the first time that I went on an adventure with Baloo, Bagheera, and Mowgli. Not remembering that sort of thing is unusual for me. Although, in this case that has more to say about how many times I watched the film as opposed to a first viewing's lack of importance. The films we rewatch repeatedly as children don't always stick with us (I do not feel that the Mighty Morphin' Power Rangers movie left a great impact in my life), but for whatever reason, every once in a while something clicks. Here are the three lessons that come to mind. 1. Balance: "You better believe it, and I'm loaded with both." 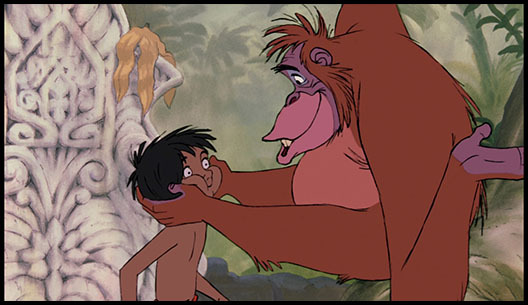 The film's primary conflict centers around Mowgli's state of wildness. It is a matter of whether he does indeed belong in the jungle or the man village. These two schools of thought are represented by the two father figures our favorite man-cub picks up along the way. Bagheera, representing the side of caution, has watched over Mowgli since he found the boy as an infant. He feels that Mowgli is no longer safe in the jungle and would do anything to get him to safety as quickly as possible. This leads to him coming of as stuffy and a bit on the overprotective side of things. It's interesting that I chose him as my imaginary friend.I think it speaks to my need for some structure despite my own goofy nature. Then, there's Baloo, every child's dream parent: a big goofy bear that lets them do whatever the heck they want. He is flawed, representing caution thrown to the wind in pursuit of the good life. In the end he is wonderful; there's a heart of gold beneath that fur. A person like me with anxious tendencies could stand to become a bit more bear-like every once in a while. I find that I am happiest in between the bear and the panther. 2. 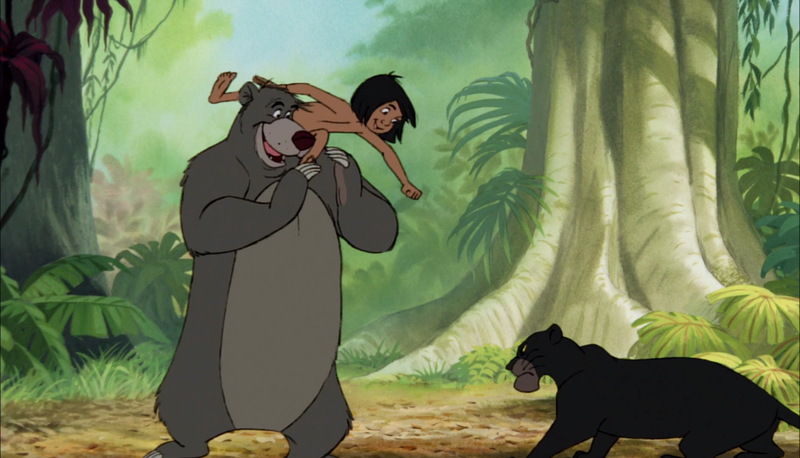 "When you find out you can live without it, and go along not thinking about it..."
"The Bare Necessities" is a song about embracing the good life and just forgetting about your problems. No, I do not recommend that you do this in every situation, but in the long run, a lot of times this mindset will leave you better off. How many of life's issues do we truly need to keep worrying about consistently? It's like the waffle principle in How I Met Your Mother: every time you go to the freezer looking for waffles, you're going to find a popsicle. You will only find waffles when you aren't looking. Yes, there are important things in life, but the sooner we stop worrying about them the more easily they will go. As an adult, I have had issues in the past dwelling on issues that stress me out. I may never be done learning this lesson. 3. "Now don't try to kid me man-cub, I made a deal with you." As a child I didn't quite realize just how sinister King Louie actually is. Sure, he's the life of the party, but only as long as you play by his rules. Louie offers Mowgli the asylum that he desires, but not out of care by any means. He wants Mowgli for what the man-cub represents, power in the form of fire. There are some people in life that are fun to be around. but just rub you the wrong way. For whatever reason your friendship fizzles and you aren't quite sure why at first. Then. you realize it weeks, months, maybe even years later: their friendship was never truly about the bond you shared, or them caring about you necessarily. When it comes down to it, the friendship faded when that person realized that they could no longer get what they wanted from you. Toxic people aren't always obvious at first, such as Kaa, but unfortunately, this lesson is most often only learned by experience. Unfortunately, adult life doesn't have talking animals or nearly as many musical numbers as I would like. Yet it is it's own jungle of sorts. We all have a choice in between heading for the man village or embracing our inner wildness. The first part of my twenties has taught me that those boundaries aren't as clear cut as many would have you believe. In the words of my favorite bear, "Take a glance at the fancy ants and maybe try a few." I like the sound of that a lot better than stopping to smell the roses. What movies from your childhood still influence you today, and howso? Huh, I hadn't really considered these bits before—but they're clearly life lessons that seem worthy of Rudyard Kipling.